Why Stripe is the worst choice for your new startup business. Keys4Coins announced on January 15, 2019, on Twitter that the Keys4Coins account was blocked. Many people have been asking what happened. Why did we get blocked? Short answer is that they somehow decided we have too high risk of fraud, which makes no sense. Read on to learn more. My name is Olav Småriset and I am the founder and business manager of Keys4Coins. I will explain our experience with Stripe in this article. Keys4Coins was started in 2014 as a hobby by me. I was a cryptocurrency enthusiast and I felt the need to create something useful while studying programming and at the same time helping cryptocurrency adoption. For this reason Keys4Coins only accepted cryptocurrencies from day one, launching in the end of 2014. Keys4Coins quickly changed from www.coinpayments.net to www.cryptowoo.com to take full control over payments with no middlemen to block the account and no fees. Keys4Coins also always held all profits instead of converting them so do not need a service like BitPay. Obviously there was almost no issues in accepting cryptocurrency payments, most of which were during high fees and backlogs in Bitcoin (BTC). Otherwise there were no fraud for example in the form of double spend, although many have tried. In January of 2018 we passed volumes where it was not anymore considered a hobby and we were requested by the government to register company. However that was not as easy as it seemed, because all banks in Norway had a ban on cryptocurrency businesses. It took almost all the year before we finally were able to get a bank account and register a limited company in Norway. More on that in a post in the future. We saw not only a big increase in sales when the cryptocurrency prices increased in late 2017 and beginning of 2018. Also when the prices went down since beginning of 2018 for many months the sales were going down. Surprisingly though it reached a limit after around middle of the year where average gross sales remained around the same for the next months. We wanted to provide an alternative payment method for all those holders out there who bought cryptocurrency high and do not want to use it for purchases. As well as those who invest in cryptocurrencies but rather want to spend fiat for products. In return to the cryptocurrency community we promised to continue working on increased cryptocurrency adoption. Purchasing from Keys4Coins with credit card would support cryptocurrencies, not so for our competitors. Security of payments is of top priority at Keys4Coins. Not strange considering how spoiled we are from accepting only cryptocurrencies as payment since 2014. That cryptocurrencies are so cheap to accept and are irreversible made it possible for us to have lower prices and focus on having the best payment and delivery possible. After a lot of research we found that Stripe would fit us perfectly, with their “Radar for fraud teams” feature where we could specify our own rules. The fees were also “reasonable”, although much higher than what we are used to with cryptocurrency being almost free for us to accept. We filled all KYC for the Stripe account registration and digital products were a category that was accepted and we did not see anywhere in the terms that selling PC games is against their terms. The account was quickly approved and we could begin the integration. Integration was very easy with their plugin and the integrated inline Stripe payments in the checkout allowed smooth payments with bank cards. So far so good. Very good experience with that and we was up and running quickly. We enabled bank card payments on December 16, 2018. We did not want to risk any charge back fraud with bank cards. We wanted the payments to be irreversible, similar to with cryptocurrency payments. Most merchants accepting cards get a significant amount of charge backs so they have to increase their prices to account for that. Also we do not want to let criminals purchase products with stolen credit cards that they can from our competitors. 3D Secure (3DS) authentication was required. With these requirements it would make sure the customer is the actual bank account owner. 3DS verifies that with the bank through authenticating the customer. For example in Norway, this would be the Norwegian bank ID identification system. Liability shift means that the bank would be liable if it was in fact a stolen credit card in use. This way we did not have to worry about credit card fraud and charge backs. Soon after we started accepting bank cards, the first card tester came to the site. Frequently trying to buy Steam gift cards with multiple credit cards until success. These were with bank cards that did not support 3DS authentication but was still considered “3DS authenticated” and had liability shift. Basically the bank in such case do not support any 3DS authentication method but they decide to take the full risk themselves and still authenticate the payment as 3DS and takes the liability even though it was not really authenticated by validating the customer identity. Block payments that are 3DS but where an actual auth was not done. This was done by block rule :card_3d_secure_support: = ‘not_supported’. Block all orders with email domain “companyail.com”. Block the payment if the IP address is anonymous. After gift cards was disabled, random PC games were being bought instead so it was obviously card testing going on. The gift cards was a good first option because it would allow them to resell it. We can imagine how much card testing and laundering is going on with our competitors who do sell gift cards for bank card payments, it must be 100% fraudulent payments. The same card tester kept on testing cards even though the email domain was in the block list and the card was not 3DS authenticated. Thanks for chatting with me earlier. It was a pleasure! As we discussed earlier, I’m passing this message on to the Specialist Team to look into further for you. They’ll be in touch as soon as they can. We could an answer already the same day, on January 4, 2019. I am Judith assisting you here. Great to see you’re trying out Radar for Teams! The charge you mentioned went through because Radar didn’t pick up signals as it being fraudulent. If you want to have this transaction blocked, you can blacklist this customer or card. You can do so through lists. These can help you both to blacklist fraudulent customers as well as protect customers who’s payment should go through. You can read more about that here: https://stripe.com/docs/radar/lists. If you automatically want to block certain users, you can set-up custom rules. You can read more about setting those up here: https://stripe.com/docs/radar/rules. With regards to the Allow button: it doesn’t look like that functionality is going to help you in this case. 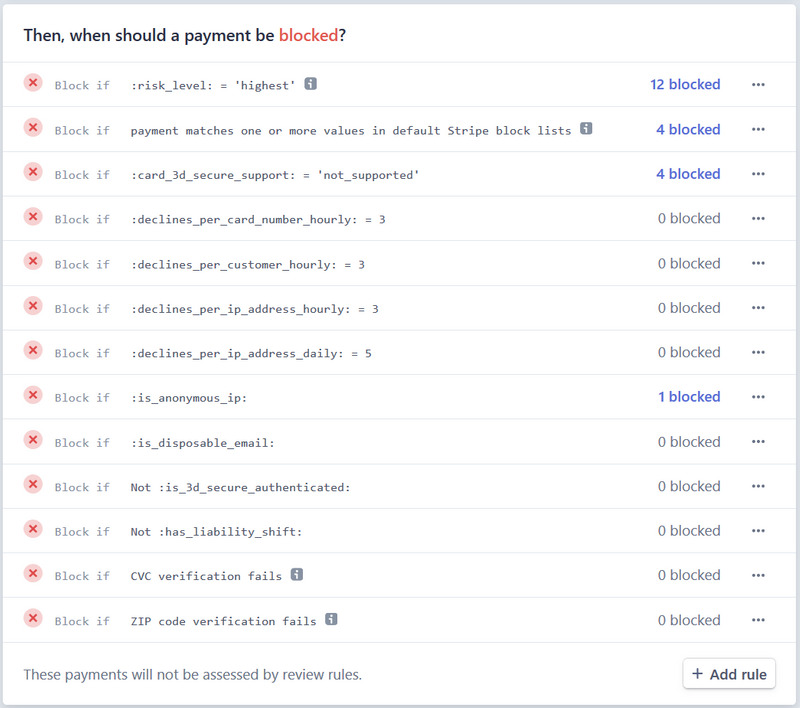 Allow rules are mostly used for payments that were blocked and should go through. It seems that the specialist did not read our chat conversation in details. All of what they said is something we already explained so we doubt that our message was actually read at all. Stripe, it would be a good idea if you actually read what your users say before you answer. No offense. They told us to blacklist the customer. But we already did that and had explained that we did that. Specifically the customer was using the email domain “companyail.com” and anonymous IP, both of which we had a block rule for. The email domain was in the email domain block list. They explained Radar did not pick it up as fraudulent. Sure, but it should have stopped it if it worked as it is supposed to with the block rules. That is because they had a problem on their end by releasing updates without testing sufficiently, keep reading to see the proof. I answered and again I explained and showed pictures that there was an allow rule that made the payment go through, and that the block rules had no effect. We remembered seeing the allow rule in the rules overview but it was removed there before the day we wanted to remove it. We asked them to either give us access to edit the rules or remove the allow rule for us. On January 7, 2019, finally Stripe saw that for a fact the allow rule was there. Incorrectly they tell us we can see it on the rules overview page although in our previous emails we explained that we cannot see or edit the allow rule because that access had been removed. It makes sense that they removed the access to ADD allow rules, but not that they removed the ability to see the default allow rules and the ability to disable those default rules, which in this case is just one rule. They incorrectly also said the rule cannot be deleted although that was a possibility the week before or so. Also to mention, the rule is still visible and can be disabled in the test data but not in the live data. So when its true that it cannot be deleted, it can be disabled which is the same effect. That this feature was removed from the live version makes no sense as that will only decrease the risk of fraud. Being able to customize the fraud protection by the merchant was the whole point of the fraud tools. We are full aware that 3DS payments with liability shift means disputes shift liability from the merchant to the card issuer (bank). But that does not change the fact that we do not sleep good at night knowing this card testing fraudster was coming every day. We do not want our shop to be used by fraudsters, no matter if we are liable for it or not. If you still want to do something about this, I would suggest to block this customer or the card. You can do so here: https://dashboard.stripe.com/radar/lists or I can do this for you as well. January 8, 2019. We said that we noticed they have been making changes to Stripe without beta testing enough before releasing such updates, causing critical bugs like this to occur. We recommended them to be careful with that in the future. Being protected does not make us feel anything better about accepting fraudulent payments. Their suggestion of using email block list will not work because the allow rule overrides it. We think they should disable the allow rule “payment is authenticated with 3D Secure and has a liability shift”. Because this rule allows for credit card testing fraud as well as use of stolen card without possibility to block it. We asked potential discount for radar for fraud teams. It was written on their website that startups can ask for discount. January 9, 2019. Finally Stripe acknowledge that this was a bug. 3DSecure allows customers to create and assign a password to their card that is then verified whenever a transaction is processed through a site that supports the use of the scheme. The addition of password protection allows extra security on transactions that are processed online. Fraudsters usually do not have access to this information. 3DSecure is one of the latest initiatives, specifically designed to reduce fraud by card networks partnering with banks, it doesn’t only protect merchants but also customers. Keep in mind that by writing your own rules, you might be preventing real customers from using your service. We offer discounts to a select group of start-ups, I had a look at your account and this discount would not apply to you. The price for you would be + 0.2kr on every successful transaction. This did not come as a surprise because we were highly suspicious that they did have a bug in their system. The allow rule should have been visible. Once again they explained liability shift, although we never asked for an explanation of this because we had read and researched a lot on it and I think we know what we have to know. It seems like they do not properly read our emails before responding. And sure we know that writing our own block rules can cause real customers to be prevented from using our website. But we are so anti fraud that we rather lose a few customers than allowing hundreds of stolen credit cards to be used in our service. Oh, and it is really nice to hear that discounts for “Radar for fraud teams” only apply to a select group of startups. It is really nice to do differential treatment of startups in that way. What group applies? Why do we not apply? We do not know. A merchant taking anti fraud measures as seriously as us, should definitely apply for a discount. After this email we decided we had said enough and we also had the issue solved. The block rules were now working. The frequent card tester was being blocked by rules of email domain “companyail.com”, anonymous IP, and cards with 3DS authentication not supported. See our full block list below. With these rules we would argue we are more protected against card fraud than almost 100% of the other merchants out there. Furthermore the payments are 100% 3DS payments with liability shift so there is no risk to Keys4Coins or Stripe that the payments are going to be reversed in charge back for fraudulent card payments. Now comes the totally illogical part where we get blocked for too high risk when literally there is almost no risk after all these anti fraud measures are implemented. This email came in our inbox by surprise on January 10, 2019. Unfortunately, we will only be able to accept payments for keys4coins.com for a bit longer. Stripe can only support users with a low risk of customer disputes. After reviewing your website and account information, we’ve found that your business presents a higher level of risk than we’re able to work with. As noted above, your service will not end immediately — we understand that moving away from Stripe can take time. To help with the transition, we are able to provide you five additional days (beginning today) to switch to a new provider. Because of the elevated dispute risk here, your account balance will be placed on reserve for the next 90 days, the industry-standard period during which most payments are disputed. During this time, the reserved funds will help cover any disputes or refunds on your account. The remaining balance will transfer to your bank account at the end of this period. If you need an alternative payment processor, we recommend considering PaymentCloud, which works with businesses with a higher level of risk than we’re able to support: https://paymentcloudinc.com/stripe. We’re sorry that we can’t offer you ongoing service and wish you the best of luck with your business. They told us that they can only accept a business with a low risk of customer disputes. Our website and account information in some magical way presented a higher risk than they could work with. The account information shows that we only accept 3DS authenticated cards with liability shift, where an actual 3DS authentication (verification of the customer identity) was done by the bank. As well as blocking anonymous IP and CVC, ZIP verification. They gave us a whole 5 days to change to another provider, which is way too little time for onboarding with 99% of the providers out there. Stripe is one of the only ones that are that quick with the onboarding. But that is just like a trick to lure you in, you would instead be blocked later. We would rather wait longer in the onboarding process and be approved than get blocked after 1 month with funds locked for 90 days. Balance would be placed on hold for 90 days, why? To cover any disputes, seriously? But no disputes are going to happen because all the balance consists of payments that were 3DS and HAD liability shift. Still they decide to hold the funds of a startup company for 90 days. That is a long time for a startup to be locked out of part of our funds. Then they are nice enough to refer us to PaymentCloud which supposedly supports a more higher risk merchant. But how are we more high risk in the first place, that makes no sense to us. With a referral link of course so they will earn money for us using Payment Cloud. Payment Cloud is much more expensive and not that good integration to our shop and the fraud tools of Stripe are more customizable. So Stripe is a much better option for us. Well surprise surprise, thats what the Radar fraud tool by Stripe is for, to reduce the risk so a high risk business can be a low or zero risk business. We answer of course again as soon as possible, the same day, to their email. We argued that our business is very low risk and we ask why they think we present a high risk. We had following rules in the Radar for fraud teams and our website to prevent fraud from happening in our shop. Only accept 3D secure supported credit cards. Only accept payments that are successfully 3DS authenticated. Plus extra anti fraud like CVC check, ZIP check, anonymous IP, anonymous email address, frequent failed payment attempts. We went on to say that Stripe is perfect for us as it has reasonable fees and the Radar for fraud teams allow us to effectively prevent fraud easily. January 11, 2019, stripes answers again, and once again it seems like they do not read our email and answer more or less a standard answer like copy pasting the same answer to all merchants who ask for a reasoning or argues. Thanks for getting in touch and for the additional information. I can totally understand where you are coming from. I would react the same way. Stripe is required by law to complete what’s called a KYC (Know Your Customer) survey for every business that signs up with us. This involves completing in-depth reviews, which outline what you’re selling, how you intend to sell it, your own description of your products and services, your website, and a variety of other factors. We use all of this information to determine if you business model is in any way susceptible to the precarious aspects of your particular field. We’re under strict regulations that dictate the exact level of risk for future disputes we’re allowed to support. During that standard review of your account and business, we came to the realization that your likelihood for future chargebacks/disputes far exceeds the rate we’re legally able to support based on those regulations. As I mentioned at the top of this email: we did a thorough review of your business and tried our hardest to continue working with you. I’m really sorry that this is the outcome. It’s extremely frustrating for us to be told we have to turn away businesses like yours. Indeed, I can’t stress enough how important our users are to this company; they are at the absolute core of our own business, as you can imagine, and we work indefatigably to empower and motivate smaller businesses like yours. Far from operating in such a way that only benefits companies that bring in the most revenue, we are driven by a desire to destabilise traditional perspectives of the online marketplace, and to, instead, embolden smaller emerging companies. I hope you can understand. Stripe, first of all we are Keys4Coins, not XXXXXX. This shows this email was just copy pasted and you forgot to change the “XXXXXX” into Keys4Coins AS. This is very disturbing and disappointing. So they somehow tried their hardest to continue working with us. If they was trying that hard they should have looked into our anti fraud measures and taken that into account, instead of just content on our website, the products we sell or payment methods we accept, or who knows what they actually found that was so bad. They found the likelihood of future chargebacks far exceeds the rate they are legally able to support based on regulations. But the likelihood is zero or almost zero because we require 3DS and liability shift for all payments plus extensive other anti fraud measures. That our anti fraud measures means a high likelyhood of chargebacks, makes about the same logic as saying 1 plus 1 equals 0. Again they refer to PaymentCloud with a referral link. Not shady at all. Very convenient to block every startup with a small volume that are linked to something you think is scary (e.g cryptocurrency) and use an affiliate program to promote another payment processor so that you can still profit off the merchant if you were wrong and the volumes end up being high. Call it a conspiracy or whatever you want, but to me it really seems like this is the case. After all they do not have a policy against the products we sell and they also approved our account when we selected the digital products category and wrote in comment details that we sell pc games. So then what could be the reason? Once again we respond the same day, January 11. We asked again for them to give a reason and to tell us what we have to change to be accepted. We are very serious on preventing fraud, so we would gladly implement any extra measures. We explain again why we argue that we are a low risk merchant. We said that PaymentCloud is too expensive for us, it does not have a good implementation in our shop, and it does not have that good anti fraud tools that Stripe has, so Stripe is a better choice. On January 14, 2019. Another response with nothing but some generic reason for why we got blocked. Thanks for taking the time to follow up on this. Please allow me to shed some light on why we have needed to make what may appear as an unfair decision. I’m afraid that I cannot comment on the status of anyone’s Stripe account. I can assure you that we take security of the utmost importance and review all accounts on an individual basis for adherence to the regulations and business practices that Stripe is required by law to maintain. I appreciate that this decision can have quite a major impact on your business. However, I can assure you that we truly did our best to support your business. As a businessman, I’m sure you understand the importance of following the standards which are in place for your business. Likewise, the agreements Stripe have in place mean that we need to very strict with the businesses we can support. I’m sorry to hear that PaymentCloud would not be a good fit for your business. I recommend that you perform due diligence to find a processor that will work well with your business. Unfortunately, we cannot recommend other payment processors as we have not performed our thorough reviews. I realize this isn’t the answer you wanted. However,I do hope this helps clear things up. I wish you the best of luck in your future ventures and I’m very sorry we can’t be there to support you along the way. Are you saying you have to block some startups just because you want to “show” that you are following the law and actually are blocking some businesses from using Stripe? Sure adds up to your statistics and show how compliant you are. They go on to insult me by saying that as a businessman, I would surely understand the importance of following the standards which are in place for my business. My business took this many anti fraud measures and is lower risk than 99.999% of all merchants out there. Now, please enlighten me because I do not know what standards are in place for my business. They are strict with the businesses they can accept. Yes, we know that, it is written in their terms and policies on their website which businesses they strictly do not accept. Our business was not one of them. What do you mean with our business? Do you mean that because we accept cryptocurrencies as payment we are a cryptocurrency business? We did not sell cryptocurrency for fiat with card payment using Stripe. Do you mean PC games? Sure, there are much fraud with stolen credit cards in PC games shops. But that is exactly why we added these anti fraud measures. They prevent the fraud from happening. Is it because we sell gift cards? But we don't, we disabled gift cards from being bought with Stripe which you only have to go to the checkout to find out and that is far from any hard work. Only one month of accepting bank card payments and our Stripe account was already blocked. We announced on January 15, 2019, that no purchases can be made with bank card anymore as Stripe blocked us. We decided we were getting nowhere with arguing with Stripe and they did not give us the reason for why we got blocked. So we decided to look elsewhere for a bank card processor and we promised to make an article on our experience with Stripe. Stripe seems incompetent in different areas. Also they are not a good fit for a startup as they seem to be too quick on the block button and not bother to try to accept a low volume merchant. I imagine if we had 100x+ as much volume they would have worked much harder to accept us. They had 1 month of volume to decide that we were too low volume for them to bother. They did not seem to read our chat and emails to support in full. They said we were wrong in our assumptions of there being a bug in their system and they multiple times said the opposite of the reality. They released updates to their systems without testing it enough causing critical bugs in their anti fraud tools, and deny of such a bug. Then they acknowledged the bug was real and we were right. They kept explaining things that we did not ask for an explanation on, like they was thinking we did not have such knowledge our self. They blocked our account for high risk when in fact it was not high risk anymore with all the anti fraud measures we put in place. They hold our funds for 90 days to cover potential disputes when none are going to happen because all payments are 3DS with liability shift. They denied to give a reason and what we can do to or change to be accepted, proving they don't actually want us at all or otherwise they would have just asked us to change something. Also one thing is for sure, we did not have a single charge back or dispute, nothing. Still to the date of this post none of the orders we got in that month were reversed. Not strange considering it was all 3DS payments with liability shift. That makes us not liable for fraudulent card payments. So our experience is that Stripe is not good for a startup. We are not the only one who experienced it this way. Other businesses have written about this in blogs as well. If you are a business that takes cryptocurrency as payment, be aware that Stripe might block your account as they might incorrectly think you are high risk based on bad assumptions that businesses who accept crypto payments must be criminals. Or they might consider you a competitor because cryptocurrencies are competing with credit card payments. Fiat VS crypto, it is all over the place these days. If you are a company that are gonna sell crypto for fiat, good luck finding any card processor that will accept you, our sister company can testify of that who has been in a loooong onboarding process with payment processors and the Norwegian FCA. I guess another post will be made on the difficulties in that business as well. If you are a business with low volume the first month, it seems that they will block your account if they are remotely suspicious that there is any fraud risk. They will not bother to tell you to implement extra anti fraud measures or what not. They will not give you a reason for why they blocked you. And they will hold your funds, which could impact a startup business a lot. If you already have big volume in the first month I believe the outcome here would be completely different. I would recommend all startups to chose a company that has a more complicated and slow on boarding process where you are sure you will not get blocked and your funds locked at a later time. Currently we are far in the onboard process with a payment processor company that is also friendly to cryptocurrency businesses. The fee is a bit higher but still, that's much better than getting blocked. The integration also looks pretty good. Any alternatives that want to provide payment processing for us and who can give us the anti fraud measures and inline integration we want in our shop, please contact us. We are looking for the best anti fraud, best integration for smooth payments and lowest prices. In the past Keys4Coins has consistently added new cryptocurrencies and is accepting multiple cryptocurrencies, instead of only Bitcoin that our competitors use. Cryptocurrencies was our only payment method since 2014 and we can testify it is the best payment method there is for a merchant. Our competitors also do not actually support cryptocurrencies other than just having it as a payment method, they auto convert to fiat. We do not. We keep all profits in cryptocurrency and we work on improving cryptocurrency adoption and we have sister companies and develop solutions for the cryptocurrency world. Do you want more cryptocurrencies supported on Keys4Coins? We do, we are not maximalists, we think more payment methods and more currencies is better for the customers. Our mother company is a programming business with focus on cryptocurrency and e-commerce. Contact We Program IT on https://weprogram.it to get an offer on a CryptoWoo plugin for your cryptocurrency so all Woocommerce merchants can accept your cryptocurrency as payment in your shop. If the cryptocurrency has high enough market cap and volume we would also consider adding it as a payment method to Keys4Coins, once the CryptoWoo add-on has been developed by We Program IT. Contact https://weprogram.it/contact or https://keys4coins.com/contact. Are you a gamer and cryptocurrency user? Then we hope you will consider using Keys4Coins as your go to shop to buy pc games and gift cards with your cryptocurrency. Usage is good for cryptocurrencies and increase their value. Especially so with Keys4Coins because we are supporting cryptocurrencies more than other businesses and believe in it as a better payment method than the traditional financial system. That is why we keep all profits in cryptocurrency and only sell what we have to, to cover our costs. Furthermore the profits go towards further development of increased adoption for cryptocurrencies. We consistently and frequently add new products and our product offering is growing fast. Keys4Coins CoinSwap: www.coinswap.keys4coins.com. A simple crypto to crypto exchange, requires no account registration, and uses multiple exchanges to give you the best rate. No complicated use of exchanges, easy and fast for the average user. Sister company Go Mach 5: www.gomach5.com. A web hosting company specializing in DDOS protected servers in Los Angeles. Also accepts cryptocurrencies. Sister company TBA: to be announced. A company that is going to make it easy to buy and sell cryptocurrencies in Norway at first, then expand to Scandinavia, then other parts of Europe, and so on. Which is in the process of compliance and getting registered with the Norwegian Financial Authority (FCA) and almost is on boarded with two fiat payment methods. So in the future when we have card payments on Keys4Coins again and if you are a cryptocurrency holder. Please consider using us. If you buy the games from us for fiat instead of using the competitors, as you see the profits will go towards developments in the cryptocurrency space. What do you think is the reason Keys4Coins got blocked. RE: Why Stripe is the worst choice for your new startup business. You are making it clear that you block anonymous users so you are anti-privacy. You even admit that you are ' so anti fraud that we rather lose a few customers' - that means you knowingly and willingyl block more legitimate users. And yet, laughably you are whining because you think stripe treated you unfairly. You just got what you deserve (and not enough of it).